Smallmouth Bass with a Big Bite! Randy Ratliff's home waters are in Eastern Tennessee and he's fished these waters most of his life. An Orvis endorsed professional guide Randy knows what it takes to get smallmouth bass on the fly. Listen in and learn Randy's secrets for hooking up with the smallies with a big bite. 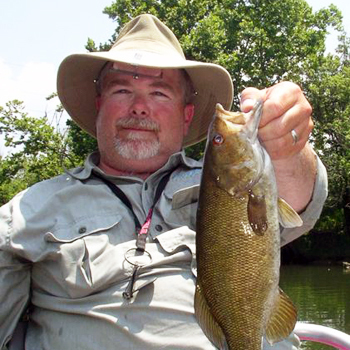 Smallmouth bass are one of the favorite game fish in the world today. They are also probably the best fighting freshwater fish to be caught on a fly rod. So if you want to join the fun in catching one of these small but feisty fishing treasures, it’s high time you get started. Randy is currently an Orvis Endorsed guide for Foscoe Fishing Company & Outfitters. He has been fishing Northeast Tennessee and Southern Appalachian rivers most of his life and guiding on them for the past six years. His passion for fishing was passed on to him by his father and grandfather. Randy has been the featured guide on the “Outdoors with Joey Mines Show”, a show about the different techniques and tactics of floating rivers and fly fishing for smallmouth. He is also on the Pro Staff for Hyde Driftnoats, Star Inflatables, and Hair/Gamma Technology Products. The smallmouth bass originally ranged north into Minnesota, Southern Quebec, and south to the Tennessee River in Alabama and west to the Eastern Oklahoma and Southwestern Arkansas areas. Today, Louisiana and Florida are the only two states in the USA that don’t seem to have smallmouth. Smallmouth bass are known by other names. They are also called bronzebacks, brownies, smallies, brown bass, bronze bass, and others. They are members of the sunfish family, which also includes the black bass and the largemouth. Smallmouth and largemouth are often compared. One of their main differences is their mouths. A largemouth bass’ mouth goes back and extends. When it’s closed, it extends back to behind its eye. It also has a very definite lateral stripe down its side. The smallmouth bass, on the other hand, has a vertical barring or tiger stripes. Its mouth does not extend back behind its eye. Usually, it’s either just in front of the eye or right to the middle of the eye. They also have more of a brownish green color compared to largemouth bass that have a true green color. Both smallmouth and largemouth can be seen together in pods and feeding so they can be caught in the same areas. Smallmouths tend to be a little more aggressive than the largemouth if they are together. If there is no alpha largemouth in the area to hold its ground, a lot of times, the smallmouth will run the largemouth off. Smallmouth don’t like contaminated and dirty environment; they are often found in cool and clear waters. They also dislike muddy water from rains. When you look for smallmouth, the bottom of the waters should have rock or gravel. They can be found in both still water and moving current areas. The ideal habitat of smallmouth contains very good protective cover such as the undercuts and shoals, slopes on banks in the lakes – basically anywhere that you can see submerged timber or logs, and standing grass beds with cattails. This will let them hide and be the predatory ambush style fish that they are. When the smallmouth bass spawn, they like the 60-degree temperature, an optimal temperature for them to spawn. When the water reaches 60 degrees during the springtime, the male will build a nest in a quiet area like a backwater eddy on a river or near the shore of a lake. It would look for an area where there is quiet water from a rock or shoal that creates a good current break or moving water for oxygenation but won’t flush anything away. The male will then guard the egg and the female will come in and they will spawn. The male will continue guarding the eggs and stay on the nest until the fry are hatched. They usually take around seven to ten days to hatch. Smallmouth eggs are usually larger than largemouth eggs. The average fly rod that most people use when fishing for smallmouth bass is either a 9-foot-5 weight or a 9-foot-6 weight, especially for beginners. A weight forward floating line and a 5-weight is a good all-around general purpose rod. It will enable you to throw a popper or a Clouser. If you want to throw a bigger bug, you can use heavier weights such as 7-, 8-, and 9-weights. Smallmouth bass feed on a variety of things – anything aquatic-type or even terrestrials. They feed on crustaceans, mollusks, small bait fish, white mayflies, frogs, lizards, crickets, grasshoppers granddaddy long-legs, beetles, etc. They are not picky. If it gets on the surface, they will at least come and look and see if it’s worth eating. When fishing smallmouth, the streamer type should be your number one fly since 90 percent of their feeding activity is underwater. The other type that you can use are the surface flies or any fly that just lay on the surface or something that has flat wings on it. One fly that Randy favors is the Todd’s Wiggle Minnow, which was invented by a local fisherman called Todd Boyer. It is a foam fly based on a salt water hook which has a movement and a vibration in the water that just seem to attract the fish whether it’s fished on the surface, pulled under like a slider, or fished down under with lead and weight. For beginners, he recommends the Todd’s Wiggle Winnow, the Gartside Gurglers, and the deer hair. Listen to our full coverage of our interview with Randy Ratliff and discover more strategies on fishing the smallmouth bass with the big bite.